The advertised dress is from London-based designer David Fielden; from the 2015 Sposa Collection which features a tribute to antique lace. 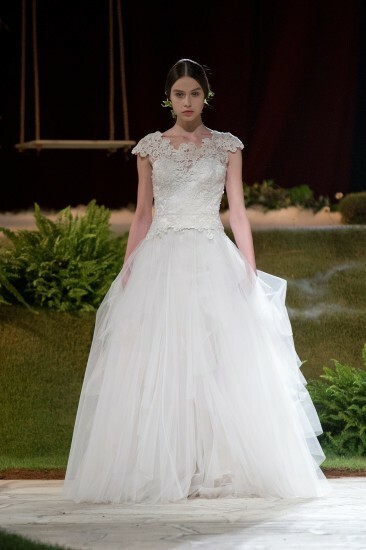 The 2015 collection shows a mix of bold, elegant, classic, and quirky aspects, and has a unique mood of a romantic garden walkway. The designs in this collection were inspired by the Parisian Ballets Russes who performed throughout Europe and South America in the early 1900's. Fielden's dresses have been worn by a following of celebrities; including Elizabeth Taylor, Julia Roberts, Kate Moss, Bette Midler, and Kelly Osbourne. This dress is new, and has never been fitted or worn since it was purchased directly from England in December 2015. Please note: * photos of this dress are images from the designer as this dress has never been worn. * the dress was purchased to fit an Australian size 8. There is no tag on the garment showing size information, however, would be happy to send physical measurements of the garment itself to prospective buyers.